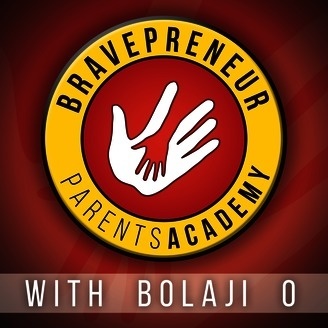 Welcome to Bravepreneur Parents Academy, with Bolaji O! Where the world's most inspiring entrepreneurs reveal their most defining childhood moments... And share their legacy for raising Brave Little Heroes who will grow up to change the world. But why a show for entrepreneur parents? Because if you aren't consciously and intentionally passing along your wisdom, and creating that quality time with your kids every day, you're letting them get those life lessons from other sources outside the family -- TV, video games, and friends from school. For most of us, there's no manual for entrepreneurship. Every PARENT has a superpower. What's yours? And do your kids know it? 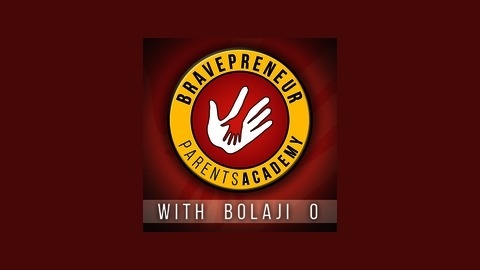 Join Bolaji Oyejide (Bolaji O) 7 days a week, as he leads a hilariously entertaining, powerfully poignant, raucously rich master class on your most important job in the world. DAD, or MOM. 049: She's a Kid Fashionista. He's a Millennial Finance Whiz. How Traveling the World Gave them The Courage Vibe. In November 2012, Riley and Ally went on a 24-country trip over 9 months with their parents. Today, along with their parents, they encourage other families to travel, see the world and pursue their own dreams through their website, TheCourageVibe.com. At the time of the trip, Riley was 16 years old and Ally was 11. The family purchased one-way tickets to Australia, and after that, had no exact plans on what they were going to do. Riley says that it didn’t sink in what they doing until several months into the trip. Riley considers himself the “last holdout” in the family, as he originally didn’t want to go and leave his friends in high school. He says the excitement of what he would miss far outweighed the nervousness and any concerns he had. The most memorable places to visit for them were Cambodia and Peru. They say that the people they met along the way were the most incredible part of the experience. Both of them picked up the most language in Turkey, while staying with a local family for a month. Riley took online courses while travelling, applying the knowledge he was learning on subjects such as theology. When Riley and Ally share their experiences with others, they keep the conversation as informal as possible, so people will feel comfortable asking questions. Riley believes that the process of figuring out what is important to each individual is what motivates kids. Through this, they realize that life isn’t “one size fits all.” He believes that kids are taking advantage of today’s technology to connect with others and expand their horizons. On the issue of teenagers and social media, he feels that kids need to surround themselves with the right people, in the right places, and they need to be proud of what they produce online. Both Riley and Ally are entrepreneurs. Ally created a book to help girls find a style that works for them, and Riley previously founded a financial education corporation for millennial. He stepped away from this venture, as travel is his passion and he realized it would keep him ground in San Francisco. He now is in Portland, OR, working with start-ups in the travel industry providing marketing and consulting services. Ally and her parents are travelling to the Dominican Republic to scout out places for their Courage Journeys, and Riley is travelling to South East Asia on behalf of a local start up to do market validation studies. In April, the formal Courage Journeys are taking place (see “INTERVIEW LINKS” for website). 047: Grandmas, Storms & Butterflies. A Legacy of Overcoming. With Jamon Glover. 046: Mom Guilt & Fire Ants. Parenting on Purpose, With Susan Seay.